After dresses and coats, boots are by far my favorite item(s) to shop for. 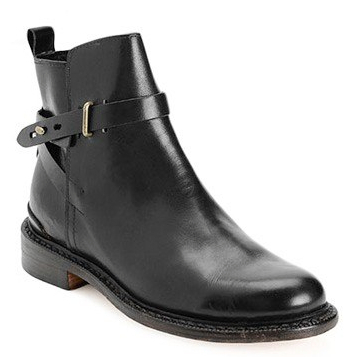 However, this ultra cool pair of Rag and Bone Driscoll black boots are TO.DIE.FOR. They are sleek, but have a hint of “biker girl” to them. They are so similar to my old ones, but with an updated rounded toe and a cool ankle strap with stud closure. If I were to drop almost $600 on a new pair of boots this fall, these would be the ones! One of my all-time biggest passions. I collect them and can remember every bad decision I’ve made to finally let go of a certain pair. It’s never failed that at some point, I’ve needed or wanted that exact pair of shoes for some reason. …brings me to these shoes! 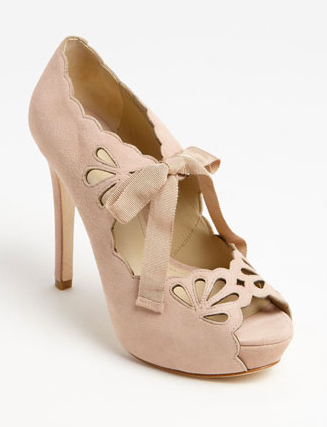 These Joan & David Cicilee pumps that would’ve been perfect for my “Gatsby” soirée early last month. I had a similar pair of these shoes once upon a time. I loved the cut-outs and the ribbon. And now, I am particularly into “cage-y” style shoes, which I guess these could be classified as… in the most demure context anyway. And they aren’t $700 like my other coveted footwear! Keep your dogs in this cage… shoe, I mean. How amazing are these cage shoes from Cesare Paciotti? On a hunt for cage shoes after wearing a bone -colored pair of my own, I found these most gorgeous shoes on the planet. Immediately, I’m converting the cost into hours worked because these are shoes that will visit me in my dreams. How hot do you think they’d look with my standard mommy-issue yoga pants? This week, I have run across two of the most UH-MAZING, and dare I say simple in the most fantastic way, dresses. And fondly enough, they were both worn to the Santa Barbara International Film Festival. One is this navy leather shift by 3.1 Phillip Lim. The leather is so butter-soft looking, and really lets you highlight gorgeous gams because of its simplicity. It looks great here with strappy sandals, but imagine it with some fierce knee boots! And what’s not to absolutely love about this Louis Vuitton frock? Elegant, simple, totally wearable for any body type and another great way to show off fabulous footwear. Although the shoes are positively covet-worthy, I probably would’ve worn it with chunky gold to pump up the stunning emerald color – buuuuut Rooney didn’t ask me to be her stylist that day… her loss. 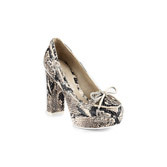 Daily Covet: Snakeskin + Platform Loafers = Must have! I know shoes are probably featured on the Daily Covet more often than not but it’s the easiest and the most fun thing to shop for. Your shoes always fit (save during pregnancy.) And those days of the month when your clothes don’t fit or you’re feeling a bit frumpy for whatever reason – slipping into a gorgeous pair of shoes can make you feel as good as new again! And these adorable platform loafers from Sperry Top Sider are no exception. I’m also making the assumption that are outrageously comfortable and heavenly to wear. A great multi-season pair of shoes, these are a must-have to wear with jeans, pencil skirts, twin sets and anything else that needs an edge!